Virginia State Bar - News - The Honorable Joseph E. Spruill Jr.
Joseph E. Spruill Jr., of Tappahannock, former president of the Virginia State Bar and retired judge of the Fifteenth Judicial Circuit of Virginia, died March 17, 2017. Judge Spruill was president of the VSB in 1976-77. He was a founding member of the General Practice Section of the VSB and one of the first faculty members of the VSB Professionalism Course. He was a Charter Fellow of the Virginia Bar Foundation. He was a past president of the University of Richmond Law School Alumni Association and a former member of the University of Richmond Board of Trustees. He also served as president of the Northern Neck Bar Association and the Fifteenth Circuit Bar Association. 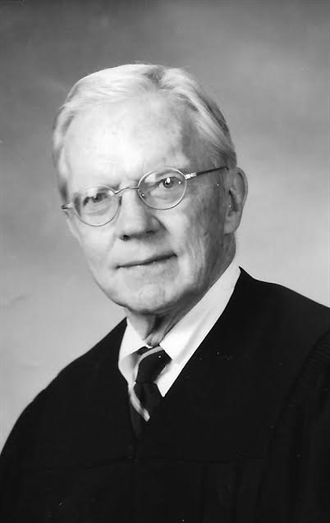 An obituary in the Richmond Times-Dispatch noted that Judge Spruill was very active in his community and in all aspects of the law. He was a former commonwealth's attorney for Essex County and town attorney for Tappahannock. He served for many years on the board of St. Margaret's School, which awarded him an honorary diploma. He also served on the board of Rappahannock Community College. In 1988 he was appointed a judge of the Fifteenth Judicial Circuit. Judge Spruill was a member of Tappahannock Methodist Church, where he held many offices over the years. He was past president of Tappahannock Rotary Club and a Paul Harris Fellow. He was a former scoutmaster of the local Boy Scout troop. He was a long-time board member of Southside Bank (now EVB). He was a member of The Jamestowne Society, The Society of Colonial Wars in the State of Virginia, and The Sons of the Revolution. He deeply loved his wife, his family, good books, classical music, oil painting, golf, and quail hunting with his ever faithful succession of English setters. He was a member of the 55 Golf Association and The Commonwealth Club. He is survived by his wife, college sweetheart and best friend of fifty-eight years, Cora Sue; and two sons, Joseph E. III (Jay) and his wife, Elizabeth Lloyd, of Richmond, and the Rev. R. Leigh Spruill, and his wife, Susalee, of Nashville, Tenn.; and seven grandchildren, Eleanor, Liz, Ella, Peter, Jack, Landon, and William. He graduated from the University of Richmond and its law school, where he was president of the student government association. He was a member of Kappa Alpha Order, McNeill Law Society, and Omicron Delta Kappa. He was a combat veteran of the Korean War, remained in the Reserves after discharge from active duty, and retired as a colonel in the Air Force Reserves. He was awarded the Legion of Merit.